A werewolf in folklore and mythology is a person who shapeshifts into a wolf, either purposely, by using magic, or after being placed under a curse. The medieval chronicler Gervase of Tilbury associated the transformation with the appearance of the full moon, but this concept was rarely associated with the werewolf until the idea was picked up by modern fiction writers. Most modern references agree that a werewolf can be killed if shot by a silver bullet, although this is more a reflection of fiction's influence than an authentic feature of the folk legends. A werewolf allegedly can be killed by complete destruction of heart or brain; silver isn't necessary.  Many European countries and cultures have stories of werewolves, including France (loup-garou), Greece (lycanthropos), Spain (hombre lobo), Bulgaria (varkolak, vulkodlak), Czech Republic (vlkodlak), Serbia (vukodlak), Russia (oboroten', vurdalak), Ukraine (vovkulak, vovkun, pereverten'), Croatia (vukodlak), Poland (wilkolak), Romania (varcolac), Scotland (werewolf, wulver), England (werwolf), Ireland (faoladh or conriocht), Germany (Werwolf), Denmark/Sweden (Varulv), Galicia(lobisun), Portugal (lobisomem) Lithuania (vilkolakis and vilkatlakis), Latvia (vilkatis and vilkacis), Andorra (home llop), Estonia (libahunt), Argentina (lobizon, hombre lobo) and Italy (lupo mannaro). In northern Europe, there are also tales about people changing into animals including bears and wolves.  IIn Norse mythology, the legends of Ulfhednar (an Old Norse term for a warrior with attributes parallel to those of a berserker, but with a lupine aspect rather than ursine; both terms refer to a special type of warrior capable of performing feats far beyond the abilities of normal people. Historically, this was attributed to possession by the spirit of an animal) mentioned in Haraldskvaeoi and the Volsunga saga may be a source of the werewolf myths. These were vicious fighters analogous to the better known berserker, dressed in wolf hides and said to channel the spirits of these animals, enhancing their own power and ferocity in battle; they were immune to pain and killed viciously in battle, like a wild animal. They are both closely associated with Odin. In Latvian mythology, the Vilkacis was a person changed into a wolf-like monster, though the Vilkacis was occasionally beneficial. 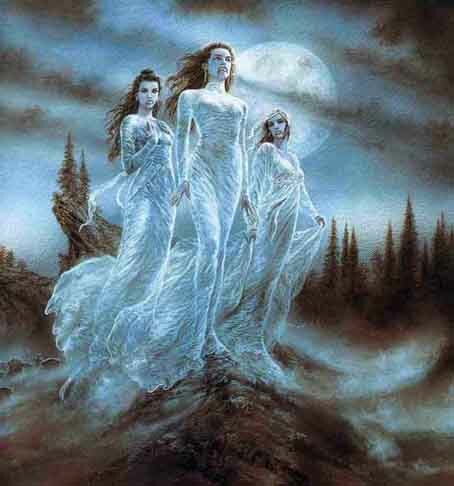 A closely related set of myths are the skin-walkers. These myths probably have a common base in Proto-Indo-European society, where the class of young, unwed warriors were apparently associated with wolves. Shape-shifters similar to werewolves are common in myths from all over the world, though most of them involve animal forms other than wolves. In Greek mythology the story of Lycaon supplies one of the earliest examples of a werewolf legend. According to one form of it Lycaon was transformed into a wolf as a result of eating human flesh; one of those who were present at periodical sacrifice on Mount Lycaon was said to suffer a similar fate. The Roman Pliny the Elder, quoting Euanthes, says that a man of Anthus' family was selected by lot and brought to a lake in Arcadia, where he hung his clothing on an ash tree and swam across. This resulted in his being transformed into a wolf, and he wandered in this shape nine years. Then, if he had attacked no human being, he was at liberty to swim back and resume his former shape. Probably the two stories are identical, though we hear nothing of participation in the Lycaean sacrifice by the descendant of Antaeus. Herodotus in his Histories tells us that the Neuri, a tribe he places to the north-east of Scythia were annually transformed for a few days, and Virgil is familiar with transformation of human beings into wolves. In the novel Satyricon, written about year 60 by Gaius Petronius, one of the characters recites a story about a man who turns into a wolf during a full moon. There are women, so the Armenian belief runs, who in consequence of deadly sins are condemned to pass seven years in the form of a wolf. A spirit comes to such a woman and brings her a wolf's skin. He orders her to put it on, and no sooner has she done this than the most frightful wolfish cravings make their appearance and soon get the upper hand. Her better nature conquered, she makes a meal of her own children, one by one, then of her relatives' children according to the degree of relationship, and finally the children of strangers begin to fall as prey to her. She wanders forth only at night, and doors and locks spring open at her approach. When morning draws near she returns to human form and removes her wolf skin. In these cases the transformation was involuntary or virtually so. But side by side with this belief in involuntary metamorphosis, we find the belief that human beings can change themselves into animals at will and then resume their own form. France in particular seems to have been infested with werewolves during the 16th century, and the consequent trials were very numerous. In some of the cases - e.g. those of the Gandillon family in the Jura, the tailor of Chalons and Roulet in Angers, all occurring in the year 1598 - there was clear evidence against the accused of murder and cannibalism, but none of association with wolves; in other cases, as that of Gilles Garnier in Dole in 1573, there was clear evidence against some wolf, but none against the accused. Yet while this lycanthropy fever, both of suspectors and of suspected, was at its height, it was decided in the case of Jean Grenier at Bordeaux in 1603 that lycanthropy was nothing more than an insane delusion. From this time the loup-garou gradually ceased to be regarded as a dangerous heretic, and fell back into his pre-Christian position of being simply a "man-wolf-fiend". The lubins or lupins of France were usually female and shy in contrast to the aggressive loup-garous. In Prussia, Livonia and Lithuania, according to the bishops Olaus Magnus and Majolus, the werwolves were in the 16th century far more destructive than "true and natural wolves", and their heterodoxy appears from the Catholic bishops' assertion that they formed "an accursed college" of those "desirous of innovations contrary to the divine law". The wolf was still extant in England in 1600, but had become extinct by 1680. At the beginning of the 17th century the punishment of witchcraft was still zealously prosecuted by James I of England, and that pious monarch regarded "warwoolfes" as victims of delusion induced by "a natural superabundance of melancholic". Many of the werewolves in European tradition were most innocent and God-fearing persons, who suffered through the witchcraft of others, or simply from an unhappy fate, and who as wolves behaved in a truly touching fashion, fawning upon and protecting their benefactors. In Marie de France's poem Bisclaveret (c. 1200), the nobleman Bisclavret, for reasons not described in the lai, had to transform into a wolf every week. When his treacherous wife stole his clothing, needed to restore his human form, he escaped the king's wolf hunt by imploring the king for mercy, and accompanied the king thereafter. His behavior at court was so gentle and harmless than when his wife and her new husband appeared at court, his attack on them was taken as evidence of reason to hate them, and the truth was revealed. Others of this sort were the hero of William and the Werewolf (translated from French into English about 1350), and the numerous princes and princesses, knights and ladies, who appear temporarily in beast form in the German fairy tales, or Marchen. Indeed, the power of transforming others into wild beasts was attributed not only to malignant sorcerers, but also to Christian saints. Omnes angeli, boni et mali, ex virtute naturali habent potestatem transmutandi corpora nostra ("All angels, good and bad have the power of transmutating our bodies") was the dictum of St. Thomas Aquinas. St. Patrick transformed Vereticus, a king in Wales, into a wolf; and St. Natalis cursed an illustrious Irish family with the result that each member of it was doomed to be a wolf for seven years. In other tales the divine agency is still more direct, while in Russia, again, men are supposed to become werewolves through incurring the wrath of the devil. Some werewolf lore is based on documented events. The Beast of Gevaudan was a creature that reportedly terrorized the general area of the former province of Gevaudan, in today's Lozere department, in the Margeride Mountains in south-central France, in the general timeframe of 1764 to 1767. It was often described as a giant wolf and was said to attack livestock and humans indiscriminately. In the late 1990s, a string of man-eating wolf attacks were reported in Uttar Pradesh, India. Frightened people claimed, among other things, that the wolves were werewolves. Ergot poisoning has been proposed as both a cause of an individual believing that he or she is a werewolf and of a whole town believing that they had seen a werewolf. However, this theory is controversial and unsatisfactory. Witchcraft hysteria and legends of animal transformations, as well as hysteria and superstition in general, have existed across the world for all of recorded history. Even if ergot poisoning is found to be an accurate explanation in some cases, it cannot be applied to all instances. An over-reliance on any one theory denies the diversity and complexity of such occurrences. Some modern researchers have tried to use conditions such as rabies, hypertrichosis (excessive hair growth over the entire body) or porphyria (an enzyme disorder with symptoms including hallucinations and paranoia) as an explanation for werewolf beliefs. Congenital erythropoietic porphyria has clinical features which include photosensitivity (so sufferers only go out at night), hairy hands and face, poorly healing skin, pink urine, and reddish colour to the teeth. There is also a rare mental disorder called clinical lycanthropy, in which an affected person has a delusional belief that he or she is transforming into another animal, although not always a wolf or werewolf. 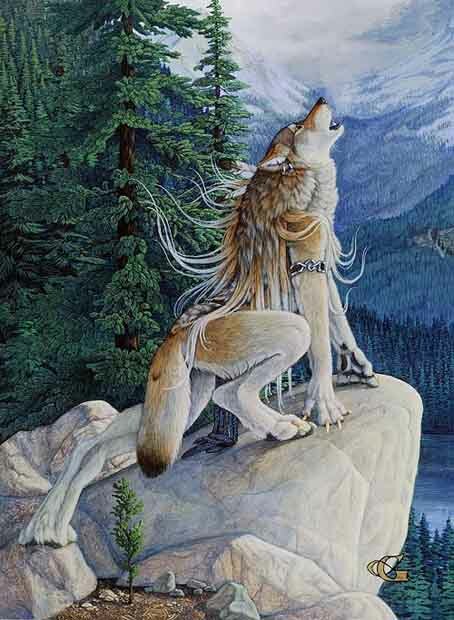 Others believe werewolf legends arose as a part of shamanism and totem animals in primitive and nature-based cultures. 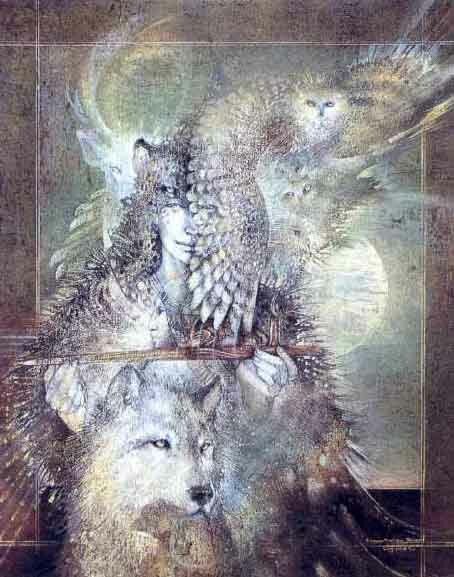 The term therianthropy has been adopted to describe a spiritual concept in which the individual believes he or she has the spirit or soul, in whole or in part, of a non-human animal. Historical legends describe a wide variety of methods for becoming a werewolf. One of the simplest was the removal of clothing and putting on a belt made of wolf skin, probably a substitute for the assumption of an entire animal skin which also is frequently described. In other cases the body is rubbed with a magic salve. To drink water out of the footprint of the animal in question or to drink from certain enchanted streams were also considered effectual modes of accomplishing metamorphosis. Olaus Magnus says that the Livonian werewolves were initiated by draining a cup of specially prepared beer and repeating a set formula. Ralston in his Songs of the Russian People gives the form of incantation still familiar in Russia. It is also said that the seventh son of the seventh son will become werewolf. Another is to be directly bitten by a werewolf, where the saliva enters the blood stream. In Galician, Portuguese and Brazilian folklore, it is the seventh of the sons (but sometimes the seventh child, a boy, after a line of six daughters) who becomes a werewolf. This belief was so extended in Northern Argentina (where it is called the "lobizon"), that seventh sons were abandoned, ceded in adoption or killed. A law from 1920 decreed that the President of Argentina is the godfather of every seventh son. Thus, the State gives him a gold medal in his baptism and a scholarship until his 21st year. This ended the abandonments, but it is still traditional that the President godfathers seventh sons. Various methods also existed for removing the beast-shape. The simplest was the act of the enchanter (operating either on himself or on a victim), and another was the removal of the animal belt or skin. To kneel in one spot for a hundred years, to be reproached with being a werewolf, to be saluted with the sign of the cross, or addressed thrice by baptismal name, to be struck three blows on the forehead with a knife, or to have at least three drops of blood drawn have also been mentioned as possible cures. Many European folk tales include throwing an iron object over or at the werewolf, to make it reveal its human form. In other cases the transformation was supposed to be accomplished by Satanic agency voluntarily submitted to, and that for the most loathsome ends, in particular for the gratification of a craving for human flesh. "The werwolves," writes Richard Verstegan (Restitution of Decayed Intelligence, 1628), "are certayne sorcerers, who having annoynted their bodies with an oyntment which they make by the instinct of the devil, and putting on a certayne inchaunted girdle, doe not onely unto the view of others seeme as wolves, but to their owne thinking have both the shape and nature of wolves, so long as they weare the said girdle. And they do dispose themselves as very wolves, in wourrying and killing, and most of humane creatures." Such were the views about lycanthropy current throughout the continent of Europe when Verstegan wrote. The ointments and salves in question may have contained hallucinogenic agents. Becoming a werewolf simply by being bitten by another werewolf as a form of contagion is common in modern fiction, but rare in legend, in which werewolf attacks seldom left the victim alive to transform. The process of transmogrification is portrayed in many films and works of literature to be painful. The resulting wolf is typically cunning but merciless, and prone to killing and eating people without compunction regardless of the moral character of the person when human. The form a werewolf takes is not always an ordinary wolf, but is often anthropomorphic or may be otherwise larger and more powerful than an ordinary wolf. Many modern werewolves are also supposedly immune to damage caused by ordinary weapons, being vulnerable only to silver objects (usually a bullet or blade). This negative reaction to silver is sometimes so strong that the mere touch of the metal on a werewolf's skin will cause burns. Current-day werewolf fiction almost exclusively involves lycanthropy being either a hereditary condition or being transmitted like a disease by the bite of another werewolf. More recently, the portrayal of werewolves has taken an even more sympathetic turn in some circles. With the rise of environmentalism and other back-to-nature ideals, the werewolf has come to be seen by some authors as a representation of humanity allied more closely with nature.